You work hard to get your website visitors to the point where they’re ready to purchase. But if you make the below mistakes, you’re going to lose a large % of these buyers during the checkout process. People have simple questions before buying a product, but it’s not easy to get those answers online. Using a website chat box where someone can ask you a quick question right away gives you the chance to address their concern and make the sale. Action Item – Use live chat on your store to answer visitors questions easily. Here’s a detailed guide. The first step on almost any e-commerce store is to choose whether to create an account, use an existing account, or checkout as a guest. The majority of people just checkout as a guest, but forcing people to choose at this step causes you to loose quite a few people. We noticed this as a common complaint to come across live chat – visitors hate extra steps to buy your product. But even if you don’t use live chat, you’ll a dropoff in your checkout process conversion rate if you force people to create an account. Make the default checkout method “guest” – and just start the checkout process! Use some technical wizardry to create an account without the user needing to do it based on the information they’re going to give you during the checkout process. Action Item – Make the default checkout option to checkout as a guest along with a (very) small option to “login” if they already have an account. But start the checkout process right away as a guest. Forcing the user to enter their entire shipping address and billing address is a hassle. But you obviously need this information, right? You can use some technical wizardry to auto-complete addresses based on only a few key strokes of the visitor. 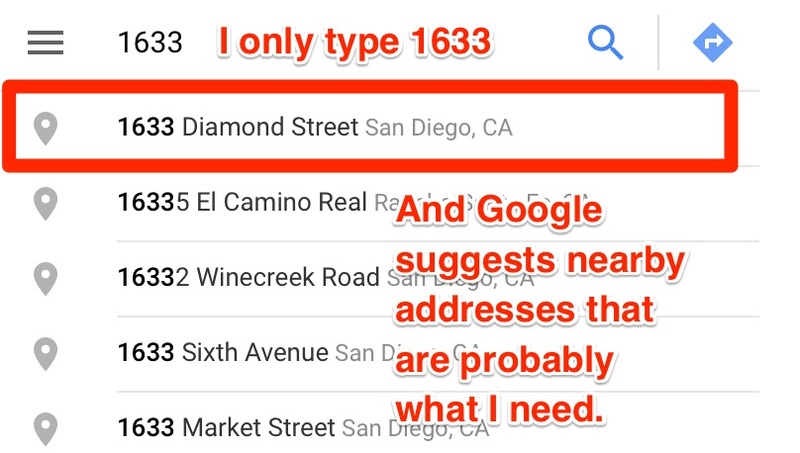 You can use the Google Maps API to automagically suggest their address based on what they’re typing. Google has a massive database of addresses, and “guesses” the address they’re going to type based on the first few address #s they type, the location of their computer, and much more. Action Item – Your developer will need to help you on this, but it’s a powerful addition to a checkout process. Get it implemented. If your visitors don’t have full confidence in your store, they’re going to leave the checkout process. The live chat option mentioned above will help with this since they can chat with a real human if they’re concerned – but clearly addressing their main concerns in the checkout process is also really important. Emphasize your simple return policy directly in the checkout process so that it’s right in front of them. Don’t give them the chance to second guess their decision of buying from you. Action Item – Make sure your return policy is clearly and concisely shown on all checkout pages, and use live chat so they can ask specific questions about shipping and returns before buying. If you ask for payment information up front, it really jars the visitor into the commitment of purchasing. Instead, ask for their shipping info first and get the payment information last. That way, they’ve already subtly “committed” mentally to the purchase process and will be more likely to finish the purchase process. Action Item – Change the order of your checkout process to get payment information after shipping information. When someone enters their credit card, make the format really simple to understand – not just plain text fields. This makes it really easy for people to compare what they entered to their credit card – yes, these subtle changes make a difference! 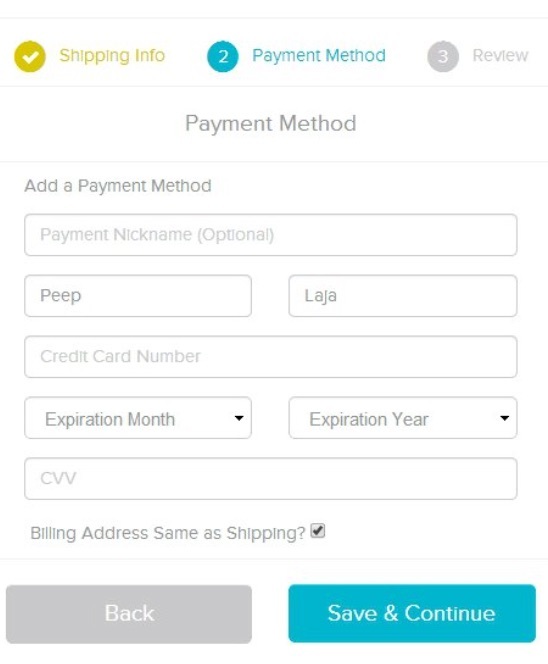 Below is an example – this is what the actual credit card entry “form” would look like on your checkout process, or similar. 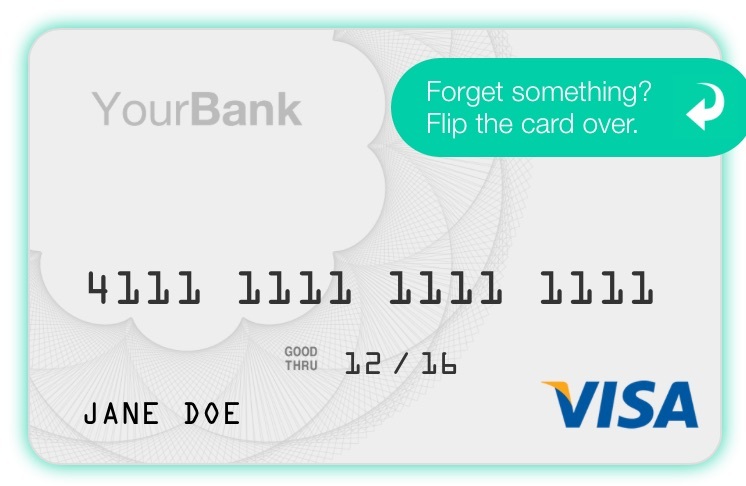 The main thing to understand is that the layout of the #s and where they’re at on the card are the same as the credit card the customer is holding in their hand. People don’t like entering their credit cards on many websites. If you’re going to collect credit cards, then you need to make people feel 100% confident in the security of your purchase process. To you as an eCommerce store owner, this might seem obvious – it’s not to your visitors. We see a ton of questions on live chat asking if their credit card will be safe buying through the store. Action Item – Make sure you showcase the security of your checkout process on the payment page. Yes, if you store credit cards then you have to be PCI compliant and deal with security processes. But it makes it much easier for customers to purchase if they’ve purchased from you in the past. An alternative that’s becoming really popular, which would work for first time customers too, is to use Amazon Payments or other third party payment methods. This allows the customer to easily checkout without entering their payment details again (i.e. they can pay with their Amazon account), without requiring you to store the credit card information. 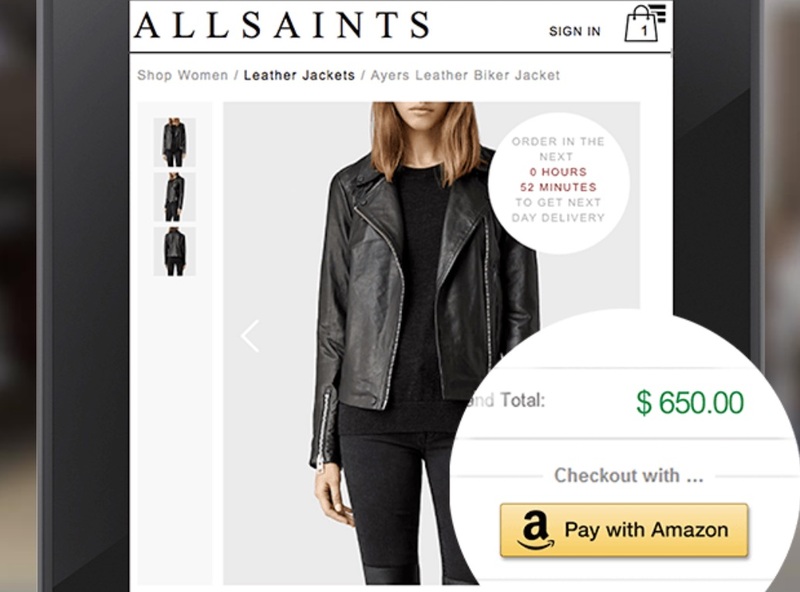 Action Item – Integrate Amazon Payments, or another method of making the payment process not require visitors to enter their payment details. If you have live chat on your website, when a visitor gets confused they can simply ask a question. This is low tech – but powerful. There’s a TON of ninja techincal stuff you can do on your website to make it better. But the easiest and most powerful is to use live chat to give you a chance to answer visitors questions directly. We’ve found the best way to use live chat for eCommerce stores, based on over 1,000,000 chats on over 100 eCommerc stores. Get a free copy of our Live Chat Strategy Blueprint here. 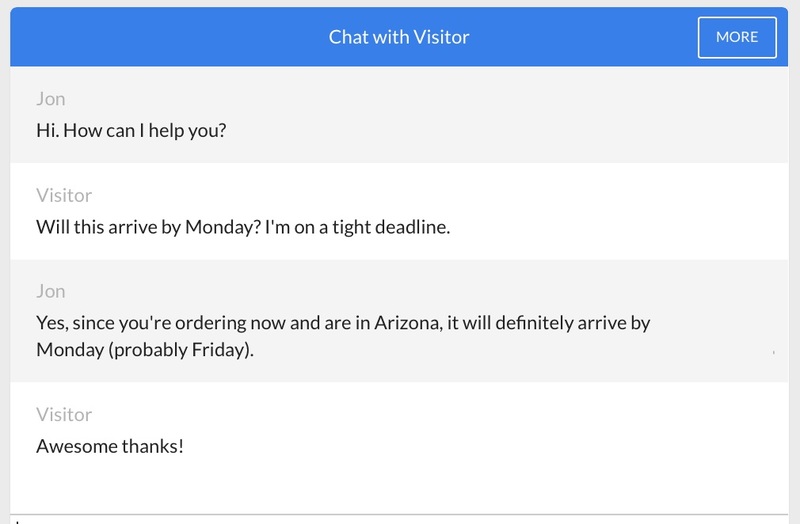 In the HelpFlow Live Chat Blueprint, you’ll see specifically how we help e-commerce stores increase conversions with live chat. Whether you work with us or not, you’ll get actionable strategies you can implement today.